UFC featherweight champion Conor McGregor says he has no fears over moving up two divisions to fight Nate Diaz in Saturday's non-title fight. The Irishman, 27, was set to face Rafael dos Anjos for the Brazilian's lightweight title in Las Vegas but the champion pulled out with a foot injury. McGregor's bout with replacement American Diaz, 30, is at welterweight. "People who don't take risks will never climb to that next level. I take risks all the time," said unbeaten McGregor. The Dubliner will be having his first contest since clinching the featherweight belt in December with a stunning 13-second victory over Brazil's Jose Aldo. McGregor's decision to stay on the bill means he remains on a pay-per-view card co-headlined by bantamweight champion Holly Holm's first defence against Miesha Tate. The Irishman and the UFC settled on Diaz, the tough-talking, veteran from a famous fighting family. Californian Diaz's brother Nick is also a mixed martial arts star but the Irishman will be expected to earn another stoppage win. "The fans show up here every time," said McGregor, of his boisterous Irish followers who again have travelled to the US in big numbers for Saturday's fight. "People pull out of fights, and then the other opponent just scraps the whole card, only thinking about themselves in their comfortable home while the fans have saved up money and been hyped for an event." McGregor has been at his combative best in the run-up to the contest with Diaz having plenty to say back. 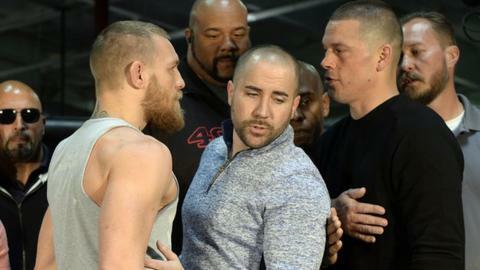 When they posed following Thursday's news conference, Diaz pointed a fist at McGregor's face. McGregor slapped it away, forcing UFC president Dana White to step between them, before security officials and Las Vegas police acted quickly to calm down the fighters' camps.